The only way to diagnose soil acidity is to sample the soil and test the pH. While liming to counter soil acidity needs to be part of normal farming practice in most of the wheatbelt, accurate knowledge of the soil pH allows more precise management decisions. 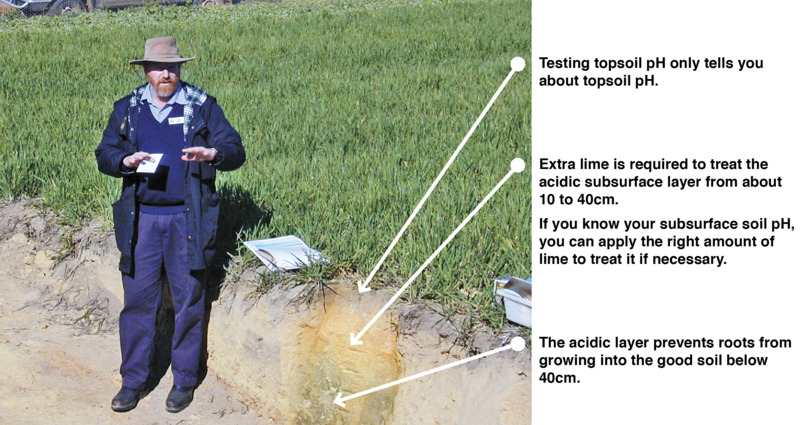 Topsoil pH can be quite different from the subsurface soil pH (Figure 1) and sampling only the topsoil may lead to inadequate lime applications. Acidity in the subsurface cannot be detected or estimated by knowing the topsoil pH. Samples should be taken at 0-10, 10-20 and 20-30 centimetres (cm) to determine a soil pH profile. Ideally, soil samples should be taken in summer, when most soils are hot and dry with minimal biological activity. This will minimise the impact of seasonal variations in pH, which will be further reduced by measuring pH in a calcium chloride solution rather than water. Paddock variability, particularly soil type changes, should be taken into account when designing sampling programs. It is important not to under-sample; knowing and understanding ‘management areas’ within paddocks will allow targeted lime inputs to maximise economic return. For example, clay soils are generally slower to acidify but require more lime to lift pH when they become acidic. The best option is to use a specialised soil-sampling contractor and seek expert advice for individual liming recommendations (Figure 2). Professional soil-sampling contractors should geo-locate sampling sites and arrange laboratory testing of the samples. They may also provide record-keeping services and liming recommendations. Sampling for soil pH testing is often done in conjunction with soil nutrient sampling for fertiliser recommendations. A do-it-yourself approach to soil sampling is possible. Divide the paddock up according to soil type and areas that have different crop or pasture growth. Typically, 6-8 sample sites per paddock is adequate, with representative sites from each soil type or management area in the paddock. If the paddock is uniform, a grid pattern can be used or evenly space sites over the whole paddock. Avoid unrepresentative areas such as stock camps, paddock corners and harvest windrows. Collect cores from around each site and bulk them into one sample, keeping the 0–10, 10-20 and 20-30cm layers separate and being careful to prevent topsoil contamination of the subsurface samples. Traditionally, soil sampling has been done with a 'pogo stick' sampler, designed to sample the top 10cm of soil. This type of sampler is unsuitable to sample the 10-20 and 20-30cm soil layers that are necessary for soil pH sampling. A 5cm diameter exhaust tube, marked in 10cm increments, is a suitable alternative (Figure 3). Figure 3 An exhaust tube marked in 10cm increments is useful for do it yourself sampling. Soil samples should be sent to a laboratory accredited with the Australasian Soil and Plant Analysis Council Inc and the pH measured in a one part soil to five parts 0.01M calcium chloride solution (measurement of pH). All recommendations are based on pH measured in calcium chloride and designated pHCa. Do-it-yourself soil sampling has a number of drawbacks; it requires a dedication to the task and inputs of time for sampling, arranging laboratory testing, sourcing liming recommendations and accurate record keeping to enable comparable repeat sampling over years for monitoring pH change.